Online fees can sneak up on you. Debt management can help. This week I ask, have you got a handle on online charges and subscription fees relating to cable and Internet-mobile services? The outlays ought to be tracked and built in to a budget that you put down in writing and use for your debt management. Check your bills from the last few months for charges that may seem to come cheap separately but that collectively over time can add up to a significant sum. You might find billings of 99 cents each for apps, $7.99 for Netflix, $6.99 for the second Hunger Games installment Catching Fire, and much more. If there are online gamers in the house, you might find bumps of $5.00 or more for each session of the very popular Clash of Clans, or at least 99 cent charges for other games. Such charges could represent just the tip of the digital spending iceberg. Think categories when zeroing in on charges and subscriptions. In a world where computers, tablets, and smartphones have practically become extensions of our bodies, fees can sprout like moles of varying sizes. I’m talking TV streaming services, movie downloads, music streaming and song purchases, newspaper digital passes, online magazine subscriptions, digital books, file storage and sharing services, learning tools, specialty group subscriptions, and more – along with those ever present apps and games. Now is always a good time to take stock of your online spending especially if you're on a debt management program. As one digital pundit pointed out recently, a mass of unchecked online service charges can allow for slippage – like a forgotten gym membership. He pointed out that without noticing he spent more in one month on Downton Abbey episodes than he spent on transit fare. 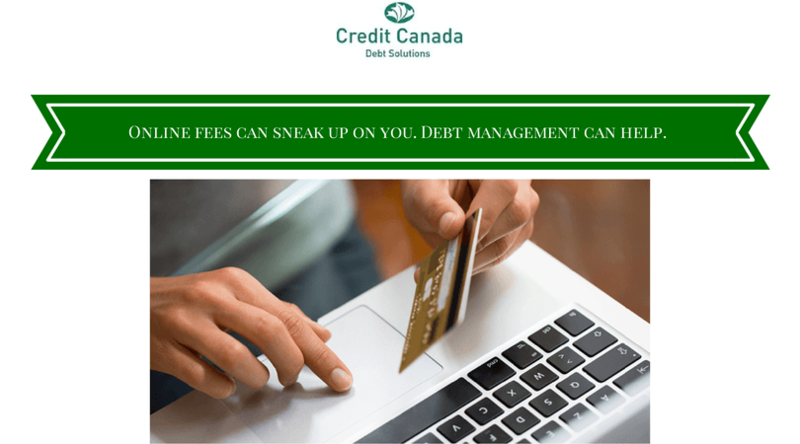 From my point of view as a credit counselling professional, I say look into not only how much you’re shelling out, but how you apportion the spending and the motivations behind it. Are you balancing fanciful wants against real needs? I can’t emphasize enough the necessity to include all cable and Internet-mobile-related spending in a budget. When you tally up all the costs for digital services and subscriptions over a year, you’ll likely discover the figure isn’t exactly small potatoes. Above all these days, watching your online spending as a part of your debt management should be a family affair. Keep the digitally savvy kids in check by all means. Consider that game stations such as Xbox and Playstation have subscriptions that range from $50 to $60 annually. Many of the apps are free, but the in-apps (meaning extensions within a game that cost money) can add up fast. I’ll bring that point home with a note about a mother and father who reportedly were dumbfounded when they discovered their child managed to spend $1,700 on virtual donuts in a Simpson’s app. I wonder if the spendthrift kid’s name just coincidentally is Bart? Track your subscriptions. Do the math with our worksheet (see below) and figure out how much you're spending. Eliminate overlap. If you have cable and multiple streaming services, prioritize the one you use the most and think about ditching the others. Go for free over premium. Make do with the free version of a service, even if you have to deal with the advertising. Don't forget to cancel. When you sign up for a digital subscription, make sure you cancel the print version. Monitor. Keep an eye on in-app spending, especially with kids. Accompanying the report was this handy worksheet, which will help with your debt management. To summarize: In our digital age, it’s wise to know your digits.